Ever wonder what the two R's stand for in J. R. R. Tolkien? Curious about whether S. E. Hinton is a man or a woman? Want to know J. K. Rowling's elusive middle name? Read on to solve those mysteries�and get on a first-name basis with other favorite children's authors. S.E. Hinton's full name is Susan Eloise Hinton. She was born on July 22,1948 in Tulsa, Oklahoma. She said, "It is was a pleasant place if you didn't like doing anything." She grew up as a tomboy and she didn't have any friends that were girls. All of her friends were boys. When she wrote her books they were about her experiences as a kid and growing up with boys. S.E. Hinton was known as "The Voice of Youth" as well as other titles after she wrote her first book when she was seventeen. 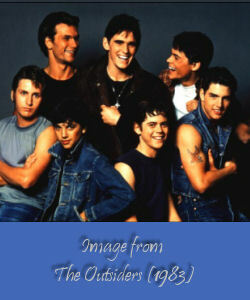 It was called The Outsiders, this book gave her alot of fame as well as alot of pressure. All of that pressure resulted in a 3 year long writer's block. Her boyfriend (and now, her husband),who had gotten sick of her being depressed all the time, eventually broke this block. He made her write two pages a day if she wanted to go anywhere. This eventually led to That Was Then, This Is Now. That Was Then, This Is Now was a much more thought out book than The Outsiders. Because she read a lot of great literature and wanted to better herself, she made sure that she wrote each sentence exactly right. This was only the start of her career as the first writer for teenagers. S.E. Hinton is a very private person, and she's very uncomfortable talking about her personal life. Her hobby is horse-back riding; She's shown both jumping and dressage. She reads constantly, and occasionally takes a class at the university not for credit - "it's more fun when you don't have to take the tests!" said S.E. A writer's life is not very exciting - usually you're alone in a room with your tools - paper, pen, imagination. (She usually write long-hand first, then put it on a computer.) She walks the dog, rides her horse, and wanders the grocery store wondering what to cook for dinner. So much for my glamourous life. I have a great husband, a wonderful son; I won't invade their privacy by saying any more. Unless I want to write about them.